Dr. Belill takes the time to explain the results of your eye exam, describe your options and listen to your eye care needs. Because maintaining good eye health is an ongoing partnership, we encourage you to ask questions and share your health information, which could be vital to monitoring, diagnosing and treating potential vision problems. 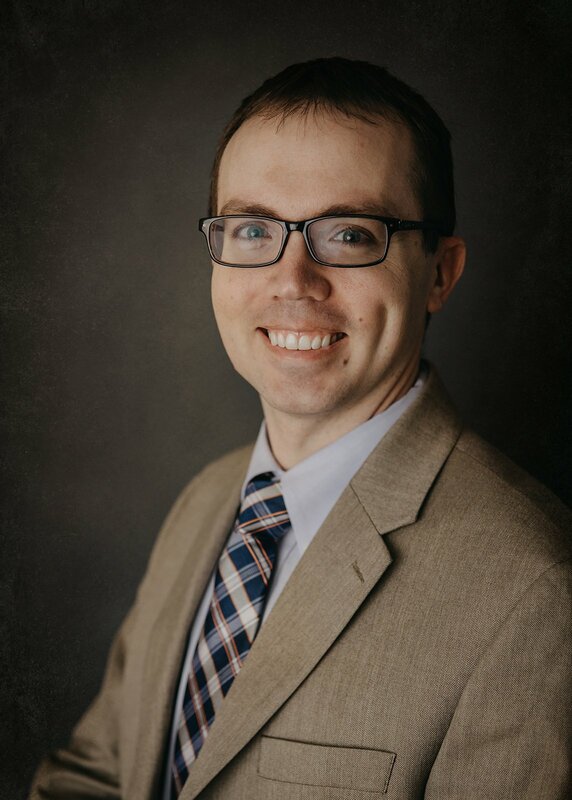 A Chemistry graduate of Hope College, Dr. Nicholas Belill wanted to pursue a career in a medical field. He met a local doctor of optometry while he was in college and was inspired to pursue eye care. Dr. Belill earned his Doctor of Optometry degree from Michigan College of Optometry at Ferris State University. He has been in practice since 2004 and was named by a national optometry publication as one of the top 300 innovators and thought leaders in field of optometry, Prevent Blindness America’s National Youth Sports Eye Injury Prevention specialist of the year and co-valedictorian of Michigan College of Optometry at Ferris State University Class of 2004. Dr. Belill’s specialties include Diabetes Eye Care and Patient Education, early detection of macular degeneration and glaucoma, ocular nutrition, scleral contact lens fitting for keratoconus, youth sports eye injury prevention, dry eyes, and corneal reshaping therapy (orthokeratology). He is a proud member of the Michigan Optometric Association, American Optometric Association, American Diabetes Association, Independent Doctors of Optometric Care, Michigan College of Optometry Alumni Board, and Michigan Children’s Vision Committee. Having grown up in Clio, Dr. Belill decided to open his Practice there to support the community. Dr. Belill enjoys spending time with family, reading presidential biographies and attending sporting events in his free time. He is married to a beautiful wife, Becky, and is blessed to have four children: Samuel, Kathryn, Hannah, and David. 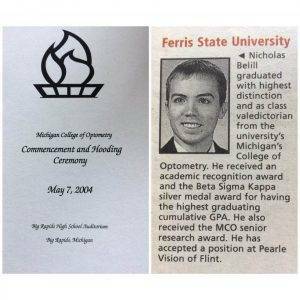 May 7th, 2004 Nicholas Belill graduated with highest distinction and as class valedictorian from Ferris St. University’s Michigan College of Optometry. He received an academic recognition award and the Beta Sigma Kappa silver medal award for having the highest graduating cumulative GPA. He also received the MCO Senior Research award. He has accepted a position at Pearle Vision. Photo published in The Flint Journal newspaper, May 22, 2004.